An Octonorm stall is also known as a shell scheme design or a one side open exhibition stand. This exhibition system comes in 3m x 3m modules and can be easily enlarged up to 6m x 3m and more, making it a basic exhibition space of 9 sq. m. to 18 sq. 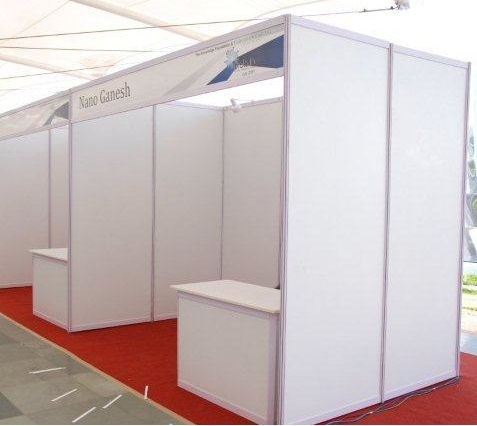 m. So, exhibition organisers categorize an Octonorm stall for exhibitors with less than 20 sq. m. of basic space. A one side open or an Octonorm stall can be extended up to a height of 8 feet and the stall design can be experimented with. Although there is not much that can be done with Octonorm stalls yet the stall designs can be conceived in a better way by complementing with appealing graphics and prints, counters and kiosks. One of the benefits of Octonorm stalls is that it can be rented out in Delhi, Mumbai, Bangalore and Chennai and all other major locations in India.